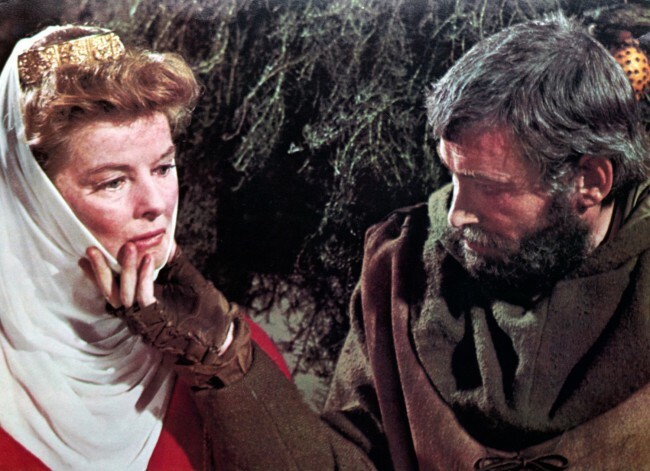 Peter O’Toole and Katharine Hepburn as King Henry II and Eleanor of Aquitaine. From an early age, Henry FitzEmpress was affected by his parents’ struggles to win England and Normandy, as well as the fact that they spent little time together – this was, after all, a marriage brokered out of diplomatic necessity that no one, including the couple, really warmed to. For the first few years of his life, Henry was looked after in his mother’s household, mainly in Anjou, although he would have been present during her attempts to win over the Norman barons in the mid-1130s once the succession crisis broke, given that the young boy provided a more palatable alternative to Matilda and Geoffrey’s rule. From around 1137 he undertook a formal education that included classical training, with knowledge of reading and writing in Latin; and was based primarily in his father’s court of Anjou. Then in 1142 or 1143 – after the final conquest of Normandy had begun in earnest, and Matilda had established a firm base in the south-west of England – Henry was invited to join his mother; this somewhat risky decision seems to have been at the insistence of Geoffrey of Anjou, although Matilda appears to have been equally keen to have her son with her. Either way, Henry was placed into the care of Robert of Gloucester, whose court was also frequented by scholars and learned men, despite the war. We know that ‘master Matthew’ tutored him in ‘letters and manners’; other prominent men included Adelard of Bath, who was probably connected with the early exchequer and corresponded with similar men of letters and learning in Spain. Adelard was therefore able to receive translations of Arabic works on science and lost texts from antiquity; and it was to the young Henry that Adelard dedicated his treatise On the Astrolabe, written around this time. Yet he also had a reckless side (possibly a characteristic inherited from his grandfather) that surfaced in 1147 when, at the age of fourteen, he decided to intervene in the war in England. Henry abandoned his studies, hired mercenaries on the promise of future payment from campaign spoils and, accompanied by his small household, sailed for England to take up his mother’s cause, rushing to the aid of magnates he had never met, but hoped one day to govern. It is likely (but not certain) that he landed at Wareham, and attempted to assail Cricklade and Purton in Wiltshire albeit without any success. However, he was unable to pay his troops and appealed to Matilda, and Robert of Gloucester, for money. Both refused, as they were not in favour of his escapade. In perhaps one of the more remarkable incidents in a war that defied logic, Henry then ‘sent envoys in secret to the king as to a kinsman’ asking for cash; even more unfathomably, Stephen agreed. If it was a calculated gamble, it appeared to have paid off. Henry was back in Normandy by 29 May 1147; four months later, on 31 October, Matilda’s military commander, Robert of Gloucester, died and she abandoned England in early 1148. From that point onwards, the empress devoted her time to Norman affairs, settling in Rouen at the priory of Notre Dame du Pré where she had special quarters made for her. With his work in Normandy completed, Geoffrey largely returned to internal politics in Anjou, where he had been forced to suppress unrest against his own rule from 1145 stirred up by his younger brother Elias. Thereafter, if Henry wanted to claim his entire inheritance, he would have to fight for it himself. In 1149 he returned to England, this time making an alliance with his relative King David of Scotland – who knighted Henry at Carlisle on 22 May, thus formally ushering him into the ranks of military commanders – and Stephen’s enemy Ranulf of Chester. However, Henry lacked the necessary resources to strike a decisive blow against the king, and once more withdrew to Normandy in early 1150. Even if Henry’s campaign had no discernible impact in England, his authority and leadership had impressed his parents; Geoffrey declared his son to be ‘of age’ and, with the support of Matilda (in whose name he governed), handed control of Normandy to him. As nominal overlord, King Louis VII was unimpressed, doubtless irritated by the fact that the decision was made without his knowledge, and alarmed by the prospect of a unified Norman–Angevin power bloc. Instead of recognising Henry as duke, Louis formally proposed that Stephen’s son Eustace should be considered the lawful ruler of Normandy, and Eustace did not hesitate in joining forces with the king of France to wage war against the duchy. Henry faced the first serious challenge to his authority; whilst Louis and Eustace captured Arques and Séez, the Norman border defences largely held; and Bernard of Clairvaux, one of the most respected ecclesiastical scholars of the era, brokered peace negotiations between Henry and Louis around 24 August 1151, which Henry’s father, Geoffrey, strongly advised him to accept. By the end of the month, Louis had invested Henry as duke of Normandy in Paris, with Henry making concessions to his new liege lord in return, ceding any claims on the Norman Vexin (which Louis had possessed since 1144 as part of his recognition of Geoffrey’s conquest of the duchy). Henry appears to have spent some time with his father during 1150, learning more about the politics of Anjou first hand when he accompanied Geoffrey on a prolonged siege of a rebellious baron’s castle; they apparently passed the time outside the castle walls reading the classical work by the Roman author Vegetius on strategy and tactics. However, Henry was not able to draw upon his father’s advice for long; on 7 September 1151 Geoffrey was stricken with fever and died suddenly at Château-du-Loir, aged only thirty-nine. Henry was proclaimed count of Anjou, Maine and Touraine, unifying these territories with Normandy under one ruler for the first time. However, Henry’s inheritance of Anjou was not without terms and conditions; as he lay dying, it was alleged that Geoffrey insisted that his body remain unburied until Henry swore an oath that he would hand Anjou to his younger brother Geoffrey once – if – he ever took possession of England. There are doubts as to the veracity of this story, but Henry certainly spent the remainder of the year ensuring his position in Anjou was secure, thus further postponing any plans to invade across the Channel, for fear Geoffrey might move against him. However, the rivalry between the brothers intensified in the spring of 1152 when both made a play for the same woman; it did not help that she was the recently divorced queen of Louis VII and one of the wealthiest, most beautiful and formidable women in Europe. Her name was Eleanor of Aquitaine. The duchy of Aquitaine had grown into one of the richest and largest regions under the nominal control of the king of France, occupying nearly one-third of the extent of the modern country but sufficiently far from Paris for the duke to be semi-autonomous – indeed, many of its lords also displayed a similarly independent attitude towards their duke, with Poitou and Gascony often pulling in opposite directions. Given its proximity to Spain, with the heady infusion of Arab influences alongside Christian tradition, the ducal court was a more liberal environment than some of its northern counterparts – which was reflected in the personality of the ruling dynasty. Born around 1122, Eleanor was the eldest daughter of Duke William X and his wife Aenor of Châtellerault. This was a complicated situation, as Aenor was the daughter of William IX’s lover, Dangerose, by her husband Aimery. Indeed the family never lost the whiff of scandal that accompanied William IX’s ducal reign. He earned a reputation as a lyric poet or troubadour, boasting in verse of his various sexual conquests, and as a territorial troublemaker after he pressed the claims of his wife Philippa to neighbouring Toulouse, creating problems that would manifest themselves in Henry II’s time. As the oldest daughter of William X, and from 1130 the heir presumptive after her brother William died aged only four, Eleanor had enjoyed the benefits of a varied education at her father’s court. She learned an eclectic mix of traditional skills required to run a household, including needlework, sewing, spinning and weaving; intellectual scholarship in music and literature, reading and writing Latin, arithmetic, history and the sciences; and the courtly skills of riding, hunting, singing and playing the harp. Indeed, it was said that she was a keen player of games similar to draughts, backgammon and chess that had been introduced from the Arab world. On 9 April 1137 William X died, having fallen ill whilst on a pilgrimage to Santiago de Compostela to visit the shrine of St James. As he lay dying, William requested that Eleanor be placed under the guardianship of his liege lord, Louis VI of France. Although seriously ill with dysentery himself, the king duly obliged; however, he ensured that his seventeen-year-old son Louis was betrothed to her first, thus extending the influence of the monarchy to a traditionally distant part of the realm. They were married on 25 July 1137 and Louis took up the titles of duke of Aquitaine, duke of Gascony and count of Poitou by right of his wife – although they were to be kept independent from the French crown, and not absorbed into the royal demesne lands. Within a few days of the marriage Louis VI was dead, and the couple were crowned King Louis VII and Queen Eleanor on 25 December 1137. By all accounts, Eleanor was beautiful and highly intelligent, but also very independently minded. Eleanor was used to a more relaxed and, frankly, flirtatious atmosphere at court in the south of France, but it was not just her dress and behaviour that provoked dismay amongst the more conservative courtiers in Paris – her family contributed to a growing sense of disapproval. Her sister Alix accompanied the new queen to court, and sparked outrage in 1142 when her dalliance with the married Raoul I of Vermandois, seneschal of France, led him to repudiate his wife, Eleanor of Blois. In a move supported by Louis VII, Raoul completed Eleanor of Blois’s humiliation when he wed Alix. The diplomatic fallout was huge, given that Eleanor was the sister of Count Theobald IV of Blois, who reacted furiously and demanded that the new marriage was annulled. Louis was already embroiled in a dispute with Pope Innocent II, who seized the opportunity to excommunicate the king for failing to act in defence of Eleanor of Blois. Louis responded by marching an army into Champagne, of which Theobald was also count, and was personally involved in the assault of the town of Vitry-le-François – an atrocity in which at least a thousand people were burned to death when the church in which they were seeking refuge went up in flames. Even against the backdrop of the chaos engulfing England and the war raging in Normandy, it was a barbarous act; in the aftermath Louis bowed to the papacy’s wishes, withdrew his troops from Champagne in 1144, and the following year agreed to go on crusade to the Holy Land by way of penance. Such a vow was necessary because the county of Edessa, one of the four main crusader states in the Middle East, had fallen to Muslim Turkish forces led by Imad ad-Din Zengi in 1144, whose encroachment in the region was helped by the death of King Fulk of Jerusalem (Henry FitzEmpress’s grandfather) from a hunting accident. According to William of Tyre, Fulk fell from his horse and was crushed by the saddle, causing such trauma to his head that ‘his brains gushed forth from both ears and nostrils’. With Christian influence in the area in severe peril of being extinguished, Bernard of Clairvaux was charged by Pope Eugene III to drum up financial and military support for the crusade, and concentrated much of his early efforts in France. Both Louis and his wife took the cross, with Eleanor leading a military contingent from Aquitaine in her own right as their duchess. Despite Bernard’s strenuous efforts, the campaign was not a success on many levels, particularly for Louis and Eleanor. Whilst drawing fulsome praise when they reached the court of the Byzantine emperor, Manuel I Comnenus, at Constantinople in 1147, the residual tension between the crusader states and the claims of the emperor in the region meant that logistical support through Byzantine-held lands in Asia Minor on the route to the Levant was half-hearted at best. The worst disaster came when Louis’s army was massacred in January 1148 by a Turkish ambush near the summit of Mount Cadmos, whilst crossing the Phrygian mountains in modern Turkey; Eleanor’s general was widely blamed and Louis VII was lucky to escape with his life. The remnants of the army limped on to Antioch, which was ruled by Eleanor’s uncle Raymond. He requested help from Louis in his struggles against the Turks based at Aleppo, but the king refused, wishing instead to press on towards Jerusalem so that he could fulfil his crusading vows. Eleanor’s impassioned pleas to her husband fell on deaf ears, and when she refused to accompany him on the next leg of their journey, Louis threatened to invoke medieval French marriage tradition and force her against her will. Her retort was to question the validity of their marriage on grounds of consanguinity, whereupon Louis arrested her in the middle of the night and carried her off to Jerusalem. At the heart of Louis’s behaviour lay a suspicion and jealousy about Eleanor’s overly familiar relationship with her uncle, of which rumours of ‘excessive affection’ began to surface from this point and dogged her for the rest of her life. The remainder of the crusade was a failure, and they headed home in separate vessels, such was the bitter nature of their disagreement. Despite an attempt at reconciliation (to which Eleanor reluctantly agreed) and the subsequent birth of a second daughter, Alice, the marriage continued to struggle. On 11 March 1152 the parties met at the château de Beaugency on the banks of the Loire to discuss a divorce, accompanied by prominent members of the clergy. 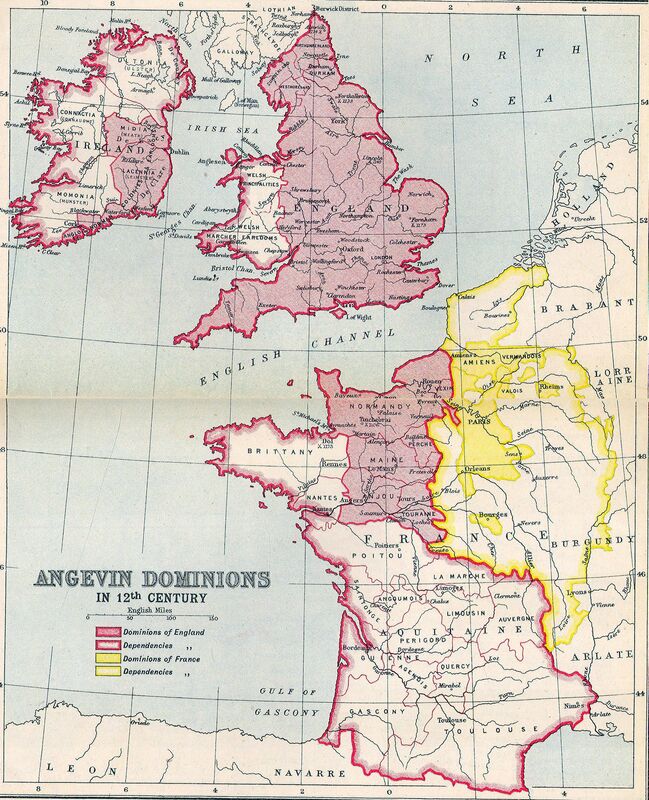 Ten days later, with the permission of Pope Eugene III, an annulment was granted on the grounds of fourth degree consanguinity and Louis removed any remaining royal troops from Aquitaine. For Louis, the risk of losing possession of the duchy was outweighed by the pressing need to produce a male heir, and thus secure the inheritance of the throne within his family. However, he could not have imagined how rapidly events would move after his divorce. On her way back to Poitiers, attempts were made to kidnap Eleanor by Theobald V of Blois and Geoffrey, Henry FitzEmpress’s younger brother. … having contrived a questionable divorce, she married Henry despite rumours circulating to the effect that she had already shared Louis’s bed with Geoffrey, Henry’s father. This, one supposes, is why their progeny, sullied as their origins were, finally came to naught. Despite the rumours, this was a stunning political coup. By the time Louis had realised what had happened, Henry had taken possession of Aquitaine, and thus two-thirds of France was under his direct control – the largest amount of territory held under one ruler since Charlemagne. Louis was both furious, as the marriage had taken place without his permission, and highly concerned about the rapid accumulation of power in Henry’s hands. He renewed his alliance with the house of Blois and, once again accompanied by King Stephen’s son Eustace, embarked upon a further invasion of Normandy on 16 July 1152. However, Louis had little success. Henry devastated the Norman Vexin, and Louis (who had fallen ill) withdrew from Henry’s lands to conclude a truce. At the same time, Henry quelled a rebellion in Anjou led by Geoffrey, who also submitted to his brother’s will. Meanwhile, in England, Stephen had taken the opportunity presented by Henry’s troubles in Normandy to renew his assault on Wallingford, which was of great strategic importance and loyal to Henry. As winter progressed, and with little chance of relief, the garrison contacted the king and agreed to surrender if no help was sent by their lord. Observing feudal etiquette, the message was also sent to Henry who, contrary to expectation, arrived in England with a modest force of 140 knights and 3,000 infantry in January 1153. Gathering his supporters, he attacked Stephen’s stronghold at Malmesbury; the king brought his army to relieve it, intending to win a decisive battle in the tradition of Hastings or Tinchebrai. The scene was set for a fight for the kingdom. However, after so many years of warfare, the leading barons were far from keen on the idea; many had reached private concords with their neighbours after Matilda left England, recognising that they had sworn allegiance to different sides in the conflict but promising not to wage war on one another unless specifically instructed to by their liege lord. Consequently, the principal supporters of each side were reluctant to commit to battle; it seems that the preferred option at Malmesbury was for each side to withdraw to separate parts of the kingdom, a form of truce that held for six months. Robert, earl of Leicester, seized the opportunity to defect from Stephen, allowing Henry to shore up his position in the Midlands, and in late July or early August Henry finally moved to relieve Wallingford. Once again, Stephen gathered ‘an inexpressibly large army from every part of his kingdom’ in another attempt to engage Henry in battle but the barons prevented conflict on the grounds that it ‘meant the desolation of the whole kingdom’. It was stalemate. With the two armies facing each other across the river Thames, neither Stephen nor Henry appeared willing to compromise, yet were unable to persuade their armies to engage in a decisive encounter. Instead, Henry moved east, captured Stamford and sacked Nottingham, whilst Stephen gained Ipswich castle. Although negotiations continued behind the scenes, the deadlock was only broken by the death of Stephen’s son Eustace on 17 August 1153; Eustace had most to lose from a peace that excluded him from the succession, and therefore had started to raid enemy territory once more in an attempt to rekindle the war. Even so, it took until 6 November before Henry and Stephen finally met face to face at Winchester to explore a diplomatic solution, and it was here that an outline arrangement was brokered. In front of the assembled barons and earls of the kingdom, Stephen acknowledged Henry’s hereditary right to England after his death, whilst in turn Henry ‘generously conceded that the king should hold the kingdom for the rest of his life’. As part of the settlement, England’s war zones would be demilitarised, including the destruction of the private castles that had been erected during the conflict. The arrangement was formalised in a charter issued at Christmas 1153. Agreeing terms and issuing a charter was one thing; translating intention into practice was quite another. Many regional lords resented having to cede the castles that had given them power and autonomy, and it was even harder to untangle the claims and counter-claims of those who had been disinherited or disadvantaged during the war. The atmosphere had grown so bad, with whispered rumours of assassination plots against the king-in-waiting, that Henry withdrew to Normandy after Easter 1154. In contrast, Stephen embarked upon a progress of the northern lands, ‘encircling the bounds of England with regal pomp, and showing himself off as if he were a new king’. Henry might yet have lost his negotiated advantage had Stephen been able to capitalise on his newfound authority, but the king died suddenly on 25 October. Unlike the last two English successions, there was no urgency on Henry’s part to rush to England to secure the throne. Accompanied by his wife, the new king sailed from Barfleur on 7 December and twelve days later was crowned by Theobald, archbishop of Canterbury, at Westminster. At only twenty years of age, Henry was now master of England, lord of Normandy and Anjou and, thanks to his marriage, in possession of Aquitaine. This entry was posted in British, France, History by MSW. Bookmark the permalink.